As a therapy, neurofeedback isn’t new. It was pioneered by Nasa in the 1960’s, as a way to help astronauts who were having fits when exposed to rocket fuel. Then it was adopted by wannabe mystics – the LSD crowd looking for a new high – which didn’t help its credibility. “Fortunately, in the 1990s technology caught up with the concept and there was scientific evidence that it works,” Lavelle says. Psychiatrists, neurologists, and military medics have given neurofeedback the thumbs-up. In America it has been used as a form of rehabilitation for former military personnel suffering from post-traumatic stress, and apparently AC Milan’s footballers use it, as do City CEO’s, poker champions and Olympic athletes to achieve peak performance. Sarah Roy, one of the cofounders, claims that the physicist Steven Hawking is a fan. A session involves wearing a hat with 19 electrical sensors. These monitor your brainwaves and convert them into audio-visual form. 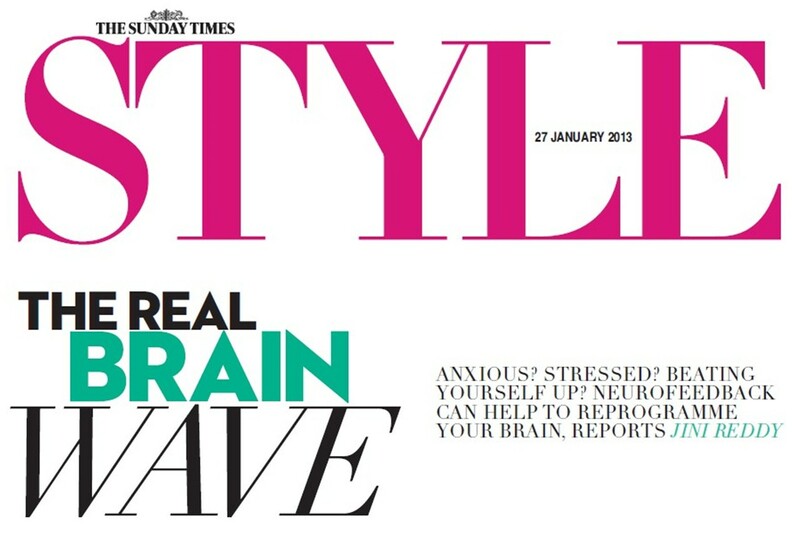 You then learn to to recognise negative patterns and train the brain to produce healthier ones,” says Lavelle. While the therapy has lots of orthodox therapeutic uses, and has been used successfully to tackle panic attacks, depression, epileptic fits and trauma, it has also, intriguingly, been an aid to reaching the higher levels of consciousness beloved of yogis, monks, and advanced meditators. A marriage between science and spirituality it may be, but as Lavelle stresses, neurofeedback is not a magic pill: “It can facilitate change, but you have to want to change.” And there are contra-indications: she won’t treat anyone with schizophrenia or bipolar disorder. By now, I’m desperate to have a go myself. What might neurofeedback do for a freelance writer who is generally optimistic, but sensitive and prone to sugar addiction and man fixations? Secretly, I wonder if a few sessions can induce those blissful feelings you get when you’re in love. Maybe I’m looking for a fix. But what’s the harm if it works? The session (I’ve signed up for seven) take place in a smart office in Fitzroy Square, central London. The first thing I notice is a giant leather armchair – more corporate than Captain Kirk’s command chair – and a screen with a swirly saver of a multi-coloured brain. I filled out a lengthy questionnaire before coming and we had a chatted on the phone, so, without too much preamble, Lavelle places what looks like a swim cap with octopus tentacles dangling from it on my head. She uses saline goo to attach the sensors – so far, so Hellraiser, I think. Initially, my brain is mapped and analysed. She tells me that it is working reasonably well (whew), but that my anxiety levels are sky-high and that it would be a good idea to work on that first. The session is painless: I play a computer game, moving a Ferrari around a track with my mind (when I was a kid I fantasised about having telekinetic abilities, so this feels pretty cool). The Ferrari whizzing round, music and beats. My brain feels like this; it’s happy, and wants to find that optimal state again. The idea is that, after a few sessions, it will without any prompting. The results are astonishing. A day later, the mind chatter that rolls like a look in my head – the what ifs, the worries – simply disappears. It’s as if someone has turned down a radio blaring in the background. A few more sessions and I have voluntarily stopped mainlining chocolate. Seriously, I think, this stuff ought to be on the NHS. A week on and I begin to feel a surge of bliss. The feeling of wanting to plug up the hole in my soul lessens. By now, I am begging Lavelle to move on to my pleasure centres. “Will you be walking around having orgasms every five minutes?” asks a friend. The answer is no, but I can’t fail to notice I’m in a state of low-level arousal (sadly, there’s no man to enjoy the fruits) and feel a calm energy in me. It’s not that there are no more irritations – it’s just far easier to put them into perspective, to detach myself from them. Lavelle reassures me: “The euphoric feelings might wear off, but your brain can’t ‘unknow’ what it’s experienced, and you’ll have reached a new state of normal,” she says. Two months on and I can vouch for that: I still feel far, far calmer and more worry-free than I did before the sessions. And I’ve noticed I’m making more sound decisions. So, is neurofeedback set to be the yoga of the Aquarian age? The downside is the cost - £1,320 for the standard 12 sessions. Even so, in London, business is brisk. “People are starting to understand the brain more, and working it isn’t as scary as it was once perceived to be.” Lavelle says. “So, yes, I think neurofeedback will eventually become commonplace.” NHS, take note. Reprinted with permission by The Reprint and Licensing Centre. Not to be reproduced without authorisation.